Here is part 2 of my dorm haul just like I promised! Yesterday was about the more basic stuff I bought, and today is all about my fun decor items. Some of this stuff I did get this summer, and other stuff I got a while ago, but I did my best to link everything or find something super similar! This isn't everything that will be in my dorm because my three lovely roommates are bringing some stuff, mostly for our kitchen space, but I will show y'all what the living space ends up looking like once all of us are moved in and settled. I am not sure if I have talked about how my dorm is set up, but I am living in an apartment style dorm. My roommates and I each have our own room and then there are two bathrooms for us to share with a common living space and a small kitchen with a fridge and microwave. Then we live across from the floor kitchen which has a stove. I am really excited to have my own space because it allows me to get away if I need to, but I do have three really great roommates. Wooden Monogram | I won't talk too much about this since I talked about monograms last week, but I am so happy with how this turned out! I can't wait to hang this up above my bed. Brunch Pillow | Weekends are for brunch, duh. When I saw this pillow in Target, I had to have it. It's so cute, and when you love brunch as much as I do, it was definitely a must have. Elephant Pillow | Elephants are the mascot for Alabama, so this gold elephant pillow was right up my alley. I think I am going to put this pillow on my desk chair since it is smaller. Travel Pillow | This is probably the most ridiculous pillow I got, but I couldn't help myself. It's so cute, and it will be nice to use when I want to sit on the floor, which I do a lot. Gold Polka Dot Pillow | This was one of the first pillows I got, and it's just been waiting in my closet to be used in my dorm. Hobby Lobby has a ton of great decorative items, and everything is divided up based on the style, so I highly recommend checking them out. Anchor Bookends (Similar) | I got these forever ago at Target when they did their nautical collection for home decor. These bookends were kind of the basis for my dorm room, which sounds crazy but I love these bookends so much. Gold, navy, and pink with slightly nautical elements is the perfect theme for my dorm room. Tuscaloosa Print, Atlanta Print, Knoxville Print | Like I talked about last week, these Evelyn Henson prints are going in the living space. Atlanta and Knoxville are my and my roommates' hometowns, and Tuscaloosa is our new city. I just got front-loading frames to hang them up. Georgia Print (Similar) | My parents got this for me my junior year when I came back from New York, and I think it is such a pretty print. I am so excited to put this in my room and have it remind me of home. If you didn't know, "Georgia on My Mind" is our state song. 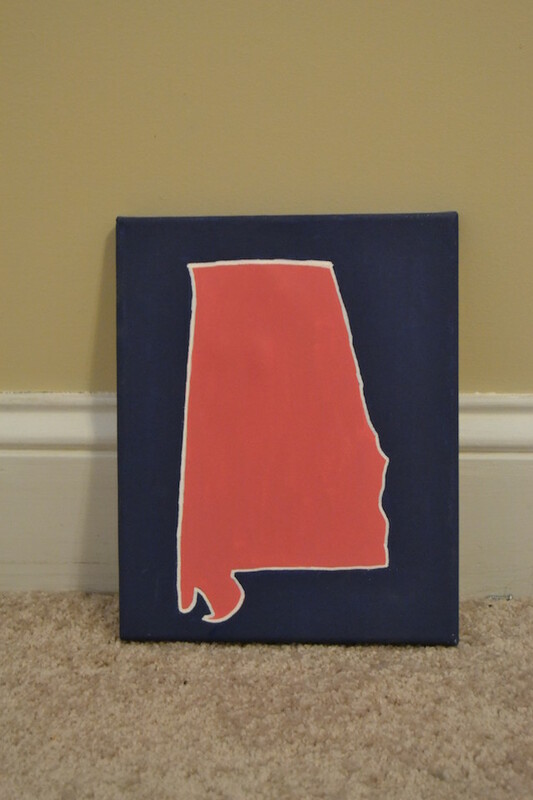 Alabama Canvas (Super easy DIY!) | I made this right after I came home from visiting Alabama the first time. Obviously crafting is one of the easiest ways to decorate your dorms, and this was super easy. I just printed out an outline of the state, traced it on a canvas, and painted! Definitely something anyone can do. Navy Quatrefoil Rug | Again I talked about my rug last week, and I wish I had an actual photo to show y'all, but it is still wrapped up in its original packaging. Once everything is set up, I will definitely show you guys what the rug looks like in my room. Pink Ottoman | When I went to orienation, I realized just how high my bed was going to be. While I am 5'9", I still had trouble getting up onto my bed and especially getting off of the bed because jumping onto the concrete was not fun. I got this ottoman to help me out. Amazon Fire TV Stick | During Amazon Prime Day, my parents ordered this for me, which I was so incredibly thankful for since I had not thought about getting one. My dad had a TV from Ohio that he gave to me for college, so having the Fire Stick is just an added bonus. I love it because it means I can watch Netflix in my dorm without having to use my computer, and since the TV is going in our living space, my roommates and I can watch stuff together. Like I said, I am moving in next Friday, and I am going to try my very hardest to vlog the experience for y'all. I really want to start to vlog while I am in college, and I think move in is the best start. 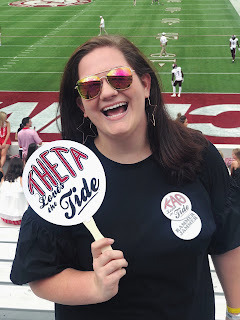 If it goes as planned, I will again try my very hardest to get it up as quickly as possible, but I am going through sorority recruitment and then classes start, so I am not 100% sure I will have time to edit!